While most people thought of him as a newspaperman, Karl Nash was really a teacher. His subject was Ridgefield and his students were its residents. As a country newspaper editor and publisher for more than 60 years, he spent his life telling townspeople about themselves, their neighbors and their institutions. Nash not only taught Ridgefield, he also served it in many official capacities – including 20 years on the Board of Education. 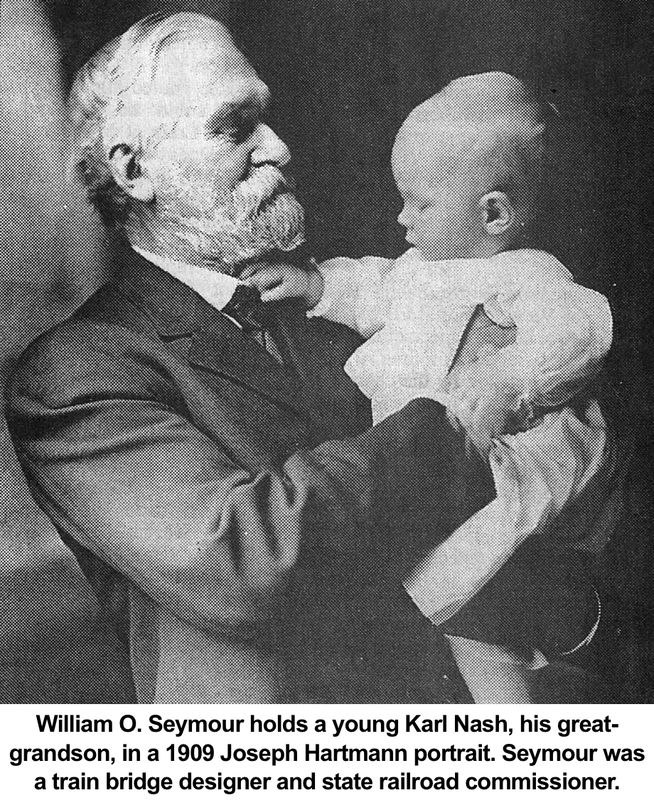 Karl Seymour Nash was born in 1908, descended from several of the founding families of the town including not only the Nashes, but the Seymours, Smiths, Olmsteds, and Keelers. His homestead on Main Street had been in his family since the town’s first settlement. His father, Howard Patterson Nash, died when Karl was 13, and his mother, Christie Law Jones Nash, was left with little money and five children to support. She worked as a librarian at the Ridgefield Library almost next door to their home — now an apartment building at 486 Main Street — and hooked rugs to sell. As the oldest child, Karl became a head of the household, helping care for the children and doing many of the chores. As he grew older, he also worked at his grandfather’s Walnut Grove Farm in Farmingville, including delivering the dairy’s milk in the village. He was a top student at Hamilton High School (later called Ridgefield High School) on Bailey Avenue, where he graduated in 1926. He went off to Harvard, planning to become a minister. However, after getting a Harvard degree in government in 1930, he turned to journalism instead. As a teenager he had already developed a nose for news, covering local events for The Ridgefield Press and area dailies, and even starting his own, short-lived “Ridgefield Record.” Back home from college, he became a Danbury Evening News reporter and in 1935, married Dorothy C. Baxter, granddaughter of D. Crosby Baxter who had founded The Ridgefield Press in 1875. (While the Baxter family was no longer associated with the newspaper, they were prominent in the community.) Karl and Dorothy later divorced; however, Dorothy’s brother Frank was married to Karl’s sister, Elizabeth, who became the longtime treasurer of the Acorn Press, parent company of the Ridgefield Press. The business included a small print shop that produced stationery products for local customers. A year later, they established The Wilton Bulletin and moved their operations from the Masonic Hall, just south of town hall, into an old garage on Bailey Avenue. 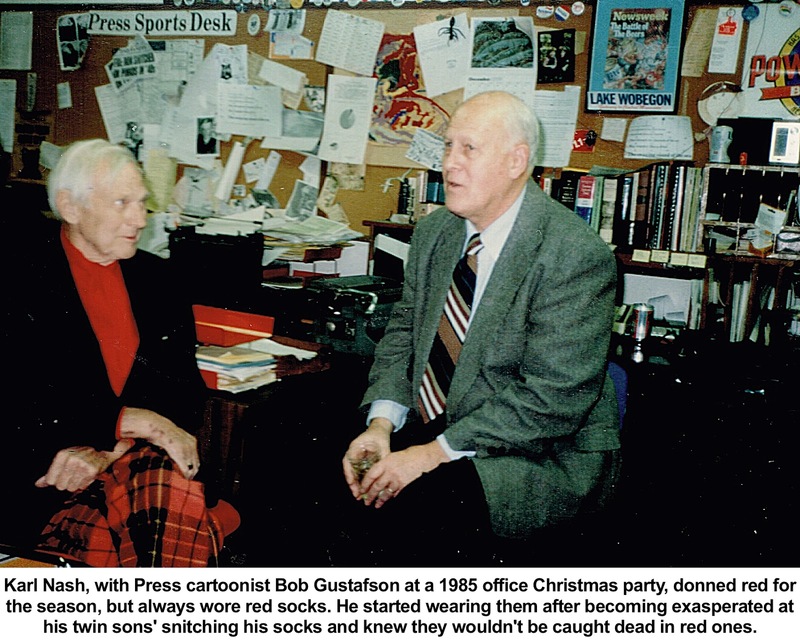 Over the years the parent company, Acorn Press, grew into a multi-million dollar group of eight weekly newspapers, which merged in 1997 with the Hersam family’s weeklies based in New Canaan to become Hersam Acorn Newspapers. In the early 2000s, Hersam Acorn was publishing nearly 20 newspapers in southern Connecticut, Westchester, N.Y., and Vermont. The papers remained in the hands of the Nash and Hersam families until October 2018 when they were purchased by Hearst. 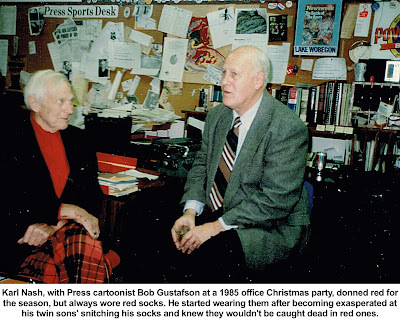 John left the business in 1948 to own and operate other weekly and daily newspapers in Connecticut and Massachusetts. He died in 2013 at the age of 101. In 1951 Karl married Elizabeth Grace Boyd, daughter of novelists Thomas Boyd and Margaret Woodward Smith. She had been hired as an intern on a 75th anniversary issue project, and the two co-edited the newspaper for many years. Under their leadership in the last half of the 20th Century, the Press’s paid circulation reached nearly 90% of the homes in Ridgefield. Always active in town, Nash was chairman of the school board for 17 years and a member from 1942 until 1962, “devoting my efforts to raising the standard of a somewhat backward school system,” he said years later. He served on several school building committees, belonged to the Parks and Recreation Commission, and moderated countless Town Meetings. who were forming the Good Government Party in reaction to what they saw as anti-education efforts by both established parties. The GGP ran candidates for the school board in 1963 and 1965, and though none was elected, one collected nearly 1,300 votes. The GGP itself never had more than 75 members and was disbanded in 1981 after many years of inactivity. He also organized, wrote for, and led substantial projects to compile histories of all aspects of Ridgefield life for special 75th and 100th anniversary editions of The Press in 1950 and 1975. The result was hundred of thousands of words of history of the community, illustrated with scores of pictures. 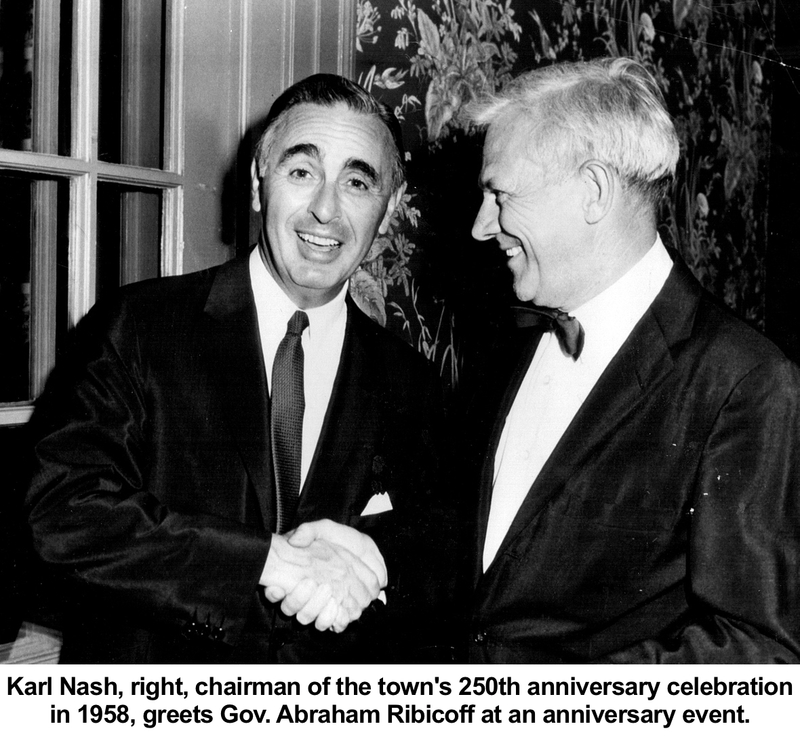 In 1983, the year he turned 75, Nash was named the Rotary Club Citizen of the Year. He was 84 when he died at his retirement home in Cocoa Beach, Fla. in 1992. “They continue to grow and prosper, however,” he added, perhaps with a twinkle in his eye.